Derek Batey – was producing and presenting shows for Border Television in the North West of England and the South of Scotland and running the local production department for that company when, late in 1967, when he saw and liked a format which had been devised by a British born Canadian called Roy Ward Dickson who was a prolific inventor and devisor of games and quizzes for both radio and television. The game was called “Mr & Mrs” and, as the title implies, its object is to show how much or how little married couples know about each other! 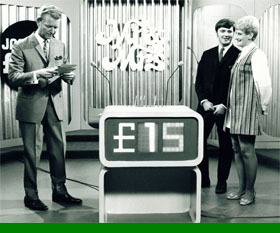 As you probably are aware, the show also produces a great deal of laughter as couples try to talk their way out of answers they’ve given which they wish they hadn’t, or as they confess their worst faults and embarrassing moments and excitement as the more answers on which they agree the nearer they get to a big jackpot. Derek liked the show and bought the rights to it for a series of thirteen programmes in the Border Television area. It was great news for Derek and for Border Television when, early in 1973, ITV announced they would take the show and screen it on the full network at lunchtime. At that time television had just gone into colour but Border TV, being the smallest and financially poorest of the network companies was still in ‘glorious black and white’. There was a real threat that “Mr & Mrs” would not be seen. 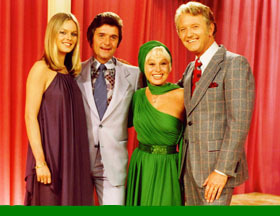 It had been chosen as part of the newly launched daytime schedule – up to that time television had traditionally started with children’s programmes such as Andy Pandy, Bill and Ben and other much loved shows around teatime. ITV made it quite plain that no way would it screen a black and white series in its new all colour daytime programming and Derek had but a few weeks to provide what they demanded. Even if Border could have afforded it, which they couldn’t, there would not have been time to buy, install and train the studio staff to operate new colour cameras and all that went with them, but fortunately Derek’s popularity and friendship with executives of neighbouring Tyne Tees TV came to the rescue. A few sleepless nights, many many phone calls and a lot of persuasive talking later, Derek reached agreement with the Newcastle based company to have the use of their studio – in full colour and with a full crew every other Sunday when he could record the “Mr & Mrs” show. This meant that on alternate weekends several cars journeyed from Carlisle to Newcastle and along with Derek went his hostess, his programme director and PS, his secretary Margaret Wood and his floor manager. Tyne Tees provided everything else including an audience and Derek organized six married couples for each recording session and two half hour shows were recorded on the Sunday afternoons. And so, early in 1973 the pink and blue set for “Mr & Mrs” was seen in its full Technicolor glory for the first time and “Mr & Mrs” was being watched by six or seven million people each week. 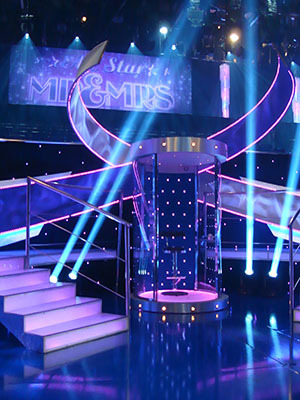 The set has undergone several ‘reincarnations’ since then, as can be evidenced by the latest which is being used in the very successful ITV1 series “All Star Mr & Mrs”, hosted by Phillip Schofield, but more about that later. 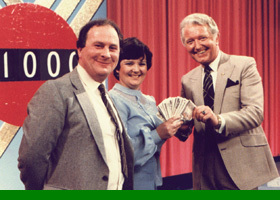 Within a few months and thanks to the revenue generated by the network series, Border was able to buy some ‘slightly used’ colour equipment and “Mr & Mrs” was able to return to its ‘home’ studio. From 1973 series after series came and went and the popularity of the show went from strength to strength. Very occasionally he would feature some well-known celebrity couples – Barbara Windsor and her then husband Ronnie Knight and the Krankies come to mind, but it is only in the last few years that ITV have asked that it become a celebrity based series, “All Star Mr & Mrs” as it’s now known. Some of you may remember a series a few years ago produced by a company called Action Time and presented by Julian Clary. Sadly, Julian’s style and type of humour saw the show being ‘panned’ by the critics, taken off air after only two editions and then moved to an obscure late night spot for the remainder of its short run. Derek presented the show for 21 years on TV and when he took the show on stage as part of a variety bill it became an instant success and he toured every seaside resort, civic theatre and cabaret club for over 5,000 performances. After a period off air a production company called Celador who made the series “Who Wants to be a Millionaire” contacted Derek and asked if they could try to interest broadcasters in “Mr & Mrs” which they had always admired. 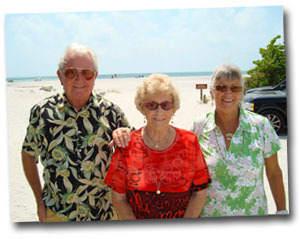 Derek agreed to allow them to represent the show and a process of development was begun. A one off version in a series called “Gameshow Marathon”, presented by Vernon Kay, caught the eye of ITV once again. During negotiations Celador were taken over by a company called 2WayTraffic, themselves subsequently taken over by Sony Pictures International. Between them they have successfully produced six series and two Christmas specials for ITV1, with series seven about to go into production and, hopefully, another Christmas special for 2015. In addition they have made deals to produce their own language versions of the game with Russia, Hungary, Poland, and Sweden, Malaysia and Finland, to name but a few. Viewers in Wales can also watch the revived version of Sion i Sian in Welsh! Thanks for joining us on the “Mr & Mrs” website and we hope you’ll enjoy the stories, anecdotes, history and lots of other good things connected with the show. Now regularly running on ITV1 in the UK and in Ireland, it is also being produced, to name but a few, in Russia, Poland, Malaysia, Sweden, Finland and Hungary in their own languages. The programme is now called “All Star Mr & Mrs” and features celebrity couples trying to prove just how much or how little they really know about each other! It’s certainly come a long way from the tiny Border Television studio in Carlisle in the North of England, where, in 1967, Derek Batey first produced and presented it. Much more of that and a whole lot of laughs in the following sections, but on a serious note, we’ve been asked to show you a notice which appeared in the show business trade paper, “The Stage” and, while most of you will have no plans to do a “Mr & Mrs” show, we have discovered in the past that some of you might and we wouldn’t want you to find yourselves in legal difficulties when an email, phone call or letter could sort things out. 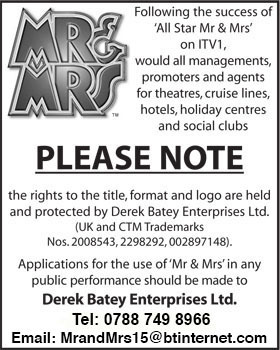 Most of it only applies to companies or organizations looking to run a “Mr & Mrs” live show/cabaret or a series of shows/cabarets for profit, so if you are thinking of doing this you’ll need to obtain a licence from Derek Batey Enterprises Ltd. before you go any further. 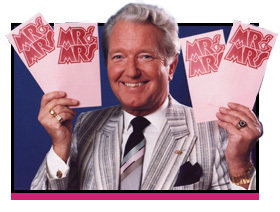 However, if you want to hold a “Mr & Mrs” evening or something similar for charity, then a letter or email to Derek Batey Enterprises Ltd., (via the link on this site), explaining what you would like to do should get you a prompt reply and permission to go ahead for your good cause. If you can include a few details of dates, times, number of shows and, most importantly, a short explanation of what form the evening/event will take and the charity supported, these will help to make it a very quick and easy process to grant permission. That’s the serious bit over, now let’s have some fun! !